Pašreiz MOTOpower skatās 47 viesi un 5 reģistrēti lietotāji. Šovakar Āgenskalnā #TimelessTour ceļojumā koncertēs Andrei Senkevich(BL). 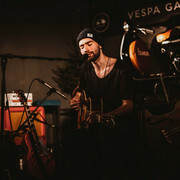 Andrei Senkevich - singer-songwriter and musician from Minsk, Belarus. Plays indie folk and instrumental music in several languages. #TimelessTour is continuation of world tour. In February 2015 debut album "Мечтатели серых улиц" (“Grey streets Dreamers" was released. In April 2016 was released single “СВЕТ” ("LIGHT'), in April 2018 - single “Як быццам сон” (“Like a dream”). The presentation of the program have already been held in Belarus, Russia, Poland, Lithuania, Estonia, Latvia, Ukraine, Moldova, Italy, Switzerland, Iceland, Austria, The Netherlands, Luxembourg and Germany. The project is constantly expanding its geography and is now working on the next multilingual record in 7 languages. These are songs about the roads and the distances, love and sincerity, dreams and changes. Every song is not just a story or a tale, it's a cry of soul and a call to action or at least thoughts about it.